One of the UK’s Leading Suppliers of Chilli Labels! Lotus Labels are one of the UK’s leading suppliers of chilli labels, specialising in providing you with a high quality, affordable solution for all of your Chilli label needs. Our state of the art presses are the ultimate choice for manufacturing Chilli Labels for large, medium or small runs! Our excellent standard has made us renowned throughout the industry for both affordability and exceptional quality. We cater for companies throughout the UK and beyond! In addition to our unbeatable production quality and great prices for Chilli Labels – we also produce a vast number of alternative label products. Are you a chilli producer looking for high quality label supplier? Then Lotus Labels are the right company for you. 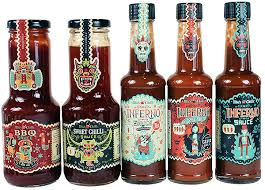 The hottest labels out of the whole range, our chilli labels are perfect for your chilli sauces. The self-adhesive labels are cost-effective and printed to the highest standard to ensure the colours maintain their vibrancy.